Thanks for the big interest and all the answers to the Dismember competition! The band and we were impressed by some very detailed answers. Our respect goes to Mathew from (USA), Natalia from (GR) and Bryn from (UK) who named all the nine bassist that ever played in Dismember. All the other winners will be contacted during the next days. Thanks to everyone who participated in the raffle! If you didn't win, stay on the line. More goodies to come soon. On February 18th 2008 a new opus of Stockholm death metal giants Dismember is coming your way!!! The first album with the new drummer Thomas Daun will be released through Regain Records without any special title. At MySpace Regain Records has launched a special Dismember page where you can check out a streaming version of "Europa Burns" and "Death Conquers All", two of the eleven new tracks of the forthcoming album. Regain Records and Metalpics are offering this exclusive package to the subscribers of the Metalpics newsletter!!! On February 21st we'll be sending out a newsletter with one question about the band. Subscribe the newsletter at Metalpics in the Mailinglist box on the top right now (don't forget to confirm your subscription), give us the answer and with a little luck win one of 20 exclusive Dismember packages! Good luck everybody and big thanks to Regain Records! The right answer on the question how many pictures of Legion Of The Damned there are in the Metalpics gallery was 725. We congratulate Beat from Bern, Switzerland for the right answer and the portion of luck! Thanks to everyone who participated in the raffle! If you didn't win, stay on the line! We have more other goodies to come soon. 23-12-2007 - Win a signed copy of the new Legion Of The Damned album!!! On January 4th 2008 Legion Of The Damned are releasing their new album "Feel the Blade". Feel the Blade is an official re-release of an album Occult once released under the name Elegy for the Weak, including 3 new songs. The album will be released as a limited edition incl. a bonus DVD, and also as a limited deluxe edition (ltd. to 1000 copies only!) incl. an embossed cover, a sticker, 6 photocards and a bonus DVD. This edition is coming in a very nice format booklet and will be available on Amazon.de only! Metalpics is offering this exclusive package to the subscribers of the Metalpics newsletter!!! On December 28th we'll be sending out a newsletter with one simple question about the band's appearance on Metalpics. Subscribe to the newsletter at Metalpics in the Mailinglist box on the top right now (don't forget to confirm your subscription), give us the answer and with a little luck win the package on the New Year's Eve 2008! Good luck everybody and thanks to Maurice and Legion Of The Damned for the great donation! 28-11-2007 - Candlemass "20 Year Anniversary" DVD out now! On October 22nd 2007 Snapper/Peaceville released the new Candlemass DVD taken at the band's 20th anniversary show on March 31st 2007 at the Kolingsborg, Stockholm (Sweden). 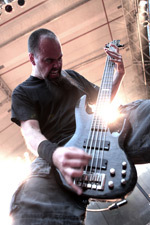 Fronted by Johan Langquist, Tomas Vikström and Robert Lowe, the band also performed with Mikael Akerfeldt, Mats Leven, Tony Martin and Janne Christoffersson as VIP stage guests. According to the official Candlemass website, the DVD contains the whole 20th anniversary show except "Bewitched" (running time approximately 2 hours) featuring performances with all the seven vocalists as well as one hour of backstage footage and interviews with all the singers. Amongst others, the cover of the DVD also contains pictures taken by Metalpics (for more details see the Metalpics news from 25-04-2007). For further information check out Peaceville or the official Candlemass website.